On April 6th 2013 the Guys from YVRBeerTweetup threw their first ever Brewery Crawl in East Vancouver. The cost was very low at around $13 and the ticket availability was just as low at around 30 tickets. The group was split in two and each group headed to the 4 breweries in a different order. The breweries involved included Storm Brewing, Powell Street Craft Brewery, Parallel 49 and Coal Harbour Brewing. 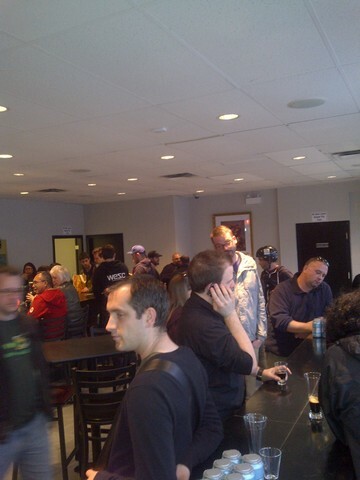 Everyone met up at the tasting room for Parallel 49 and sampled a few brews while waiting for everyone to arrive. The group I was part of (Team Awesome) headed to Storm Brewing first. The Brewmaster James is a very busy guy as he is a staff of One at the brewery and as such does not usually do tours. I was stoked to be heading to this brewery first. I am a huge fan of his beer especially his sours. A very interesting point about Storm Brewing is that everything used in the brewery is second hand and re-purposed. For example the mash tun was used for making yogurt originally. James’s past growing up on farms has made him handy enough to do all the alterations and welding to his brewing equipment. We were treated to samples of his “Scottish Highland Cream Ale“, ” Hurricane IPA” and the “Imperial Sour Flanders Red“. One more interesting note is that James may be the first person making sours in BC but it was all by accident. His beer turned out different than he expected and in turn turned all of this other beer sour as well. To me this was a very happy accident as the Imperial Sour Flanders Red was my fist experience with sour beer and still the standard I hold all others to! Once done at Storm Brewing we thanked James for his hospitality and headed by foot to our next destination Powell Street Craft Brewing. Once there we met up with the brewmaster David and his wife Nicole that works the tasting room. This is by far the newest brewery on the circuit for the day opening its doors in December 2012. They may be young but they are making amazing beer and already starting to expand from the sound of it with a new fermentor on the way! I hope this means they will be able to keep up with demand a little better now. We were all very lucky on this day to be able to try their brand new “Belgian Witbier with Ginger And Cardamom” that had just been released that day! We also sampled their “Old Jalopy Pale Ale“, “Hopdemonium IPA” and their “Dive Bomb Porter“. All of these beer are top notch buy my personal favorite and most often filled growler is the Old Jalopy Pale Ale. David went though his brewing process at the brewery (the very small nano brewery!). All of their bombers are filled off of a filler that fills only 2 bottles at a time from kegs. To see a more in depth look at the Powell Street Brewery check out this link Banner Hanging. The next stop on the tour was Parallel 49 Brewing the second youngest brewery on the tour but now by far the largest! parallel 49 has been around since spring 2012 but has been expanding like mad since then. One of the owners of the brewery also owns the restaurant St Augustine’s on Commercial Drive. We were lucky enough to have a tour of the brewery from Graham the brewmaster. This is my second time receiving a tour of the brewery by him although it looks nothing like it did back then (See here). They have tons of new tanks and a new unit in a building across the alley with a barrel aging room, large cooler and packaging area! Parallel 49 makes some amazing year round brews but really excels in their crazy interpretations of different styles of beer with their seasonals! We even go to try one of these unreleased seasonals right from the tank before they have perfected it (lets hope it stays close to that as it was amazing)! Everyone on the tour was in awe of the scale of this craft brewery especially due to its age! Come on its only been selling beer for just under a year! Graham has not slowed down on his ideas either and has even done a collaboration beer with Gigantic Brewing Company out of Portland Oregon. If this brewery is to expand any more it will have to take over units in one of its two buildings it is getting so cramped. We were free to try any of their beer that they had on tap in the tasting room and most of us did just that. Graham outside Chemistry Lab. He is a chemical engineer by trade. tap lines for tasting room! Last but certainly not least we headed to Coal Harbour Brewing Company which happens to be across the street from Parallel 49. The Head Brewer Ethan Allured was good enough to show us around the brewery and tell us all about their operation and how everything worked. We got a look at their new canning line that they are quite proud of and for good reason as it is pretty impressive. I think this would be the second largest brewery on the tour but someone could correct me on this point. Coal Harbour brews both Lagers and Ales but their main production is craft lager without any adjuncts (think rice and corn such as Molson and Bud). Everyone on the tour was able to sample both their “311 Helles Lager” and their “Smoke & Mirrors – Imperial Smoked Ale”. Coal Harbour even hooked everyone on the tour up with a nice little gift of some beverages! THANKS! Once the tours were done everyone headed back to Parallel 49’s tasting room as it was nice and large. The group had more samples or purchased sleeves of their favorite brew all while discussing all the fun they had just had! I would like to thank the breweries Storm, Powell Street, Parallel 49 and Coal Harbour as well as YVRBeerTweetup‘s Jonathan (@JonnyBeers) and Nick (@VancityBeerGuy) for making this amazing event happen. I look forward to what you have in store next. This entry was posted in Brewery, Tweetup and tagged #eastvanbrewcrawl, ale, bc, beer, brew, brew crawl, breweries, brewery, brewery crawl, canada, coal harbour brewing company, east vancouver, event, lager, parallel 49 brewing, powell street craft brewery, storm brewing, tasting, tastings, Tour, tweetup, vancouver, yvrbeertweetup. looks like an absolute blast! Great post! It really was. The guys are looking at holding a second round of this tour due to the reception they got!